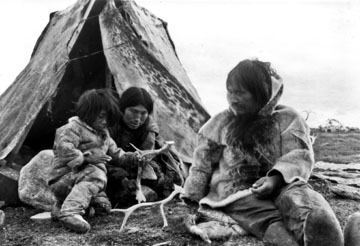 The native Greenlanders of a couple of centuries ago had a great variety of amulet, and Hans Egede, in his Description of Greenland, notes these “Amulets or Pomanders” which the natives wore about the neck or arms, the materials being of the most heterogeneous kind, pieces of old wood, old fragments of stone, bones of various animals, the bill and claws of certain birds, and many other objects whose form or associations had suggested the possession of a magic potency. A similar account of old Greenland amulets is given by David Crantz, another early author, who even asserts that some of the amulets were so grotesque that the natives themselves occasionally laughed at them. In the absence of any more definite talisman, recourse was sometimes had to the expedient of binding a leather strap over the forehead or around the arm. Possibly, however, some talisman was hidden beneath this strap, or else it may have been designed to serve as a point of support for an amulet that had been taken off at the time the traveller saw the strap. Animal amulets, that is to say, amulets for animals, are in use in the Arctic regions, one class of these being stones that have fallen from a bird-rock. These the Eskimo attach to their dogs, proceeding upon the theory that as these pieces of rock in falling from a great height have traversed the air with tremendous rapidity, they will communicate the quality of fleetness to the dogs. 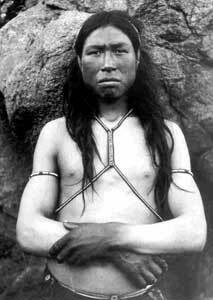 This transmission of an acquired quality of the stone to the person wearing it is shown in other instances, a favorite amulet with the Eskimos being a piece of an old hearth-stone. This is believed to give strength to the wearer, because the stone has so long endured the attacks of fire, the strongest and fiercest element. Such fragments of stone are often worn by Eskimo women, who wrap them up in pieces of seal-skin, making in this way a decoration to be worn on the neck.